We use the very best materials and tools to repair any crack or chip you have in your vehicle’s glass. Our expert staff offers radiator service and repairs for all makes and models, both foreign and domestic. Contact us today and let our technicians diagnose and repair any problems you are having. There’s only one name to trust when it comes to auto glass repair. 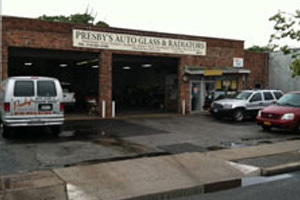 Rely on Presby’s Auto Glass & Radiator Service of Valley Stream, NY to do it for you. We have been proudly serving the area since 1955. We accept all insurance companies! Presby's Auto Glass & Radiator Service offers quality services for all makes and models! Mobile Services and home & office pickups.